To make great wine, you must have great fruit. Cliche, but true. Winemaking really begins in the vineyard where everything from pruning to harvesting must be done with consideration for the past, present and the future. It takes a judicious hand to guide those grapes through to finished wine in the bottle. There are as many paths to go through that process as there are winemakers in the world, from highly technical to totally hands off. We tend towards the least manipulation necessary to ensure the path to high quality wine. Crafting wines that are balanced, elegant and uniquely complex is what makes our wine distinctly express the terroir of our vineyards. This dry wine exudes harmonious aromas of white flowers, ripe peach, apricot, honeydew, and pineapple reminiscent of the beach at sunset! 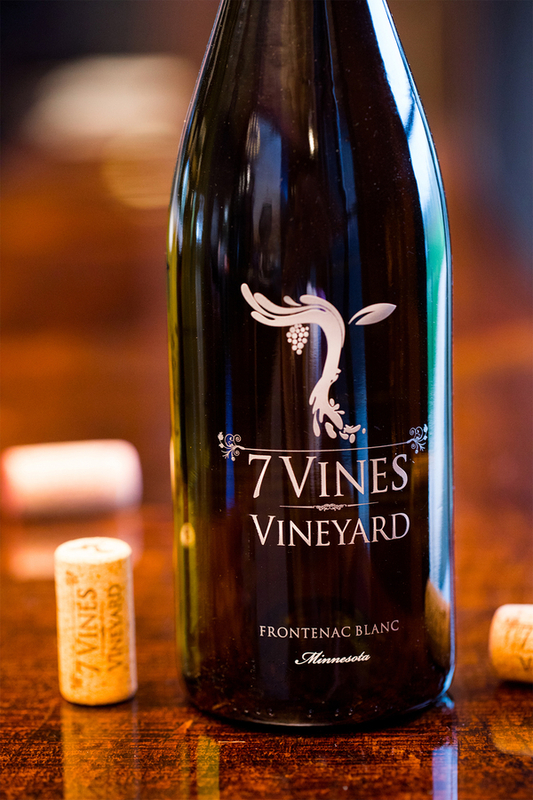 It’s crisp and vivacious flavors of mango, peach, marmalade and lemon meringue are refreshing on the palate Brilliant gold in color, this Frontenac Blanc is lively and luxurious. Savor and sip as tropical flavors extend into a long generous finish. Pairs well with roasted pork tenderloin, baked salmon or pasta with white sauce. Serve chilled. 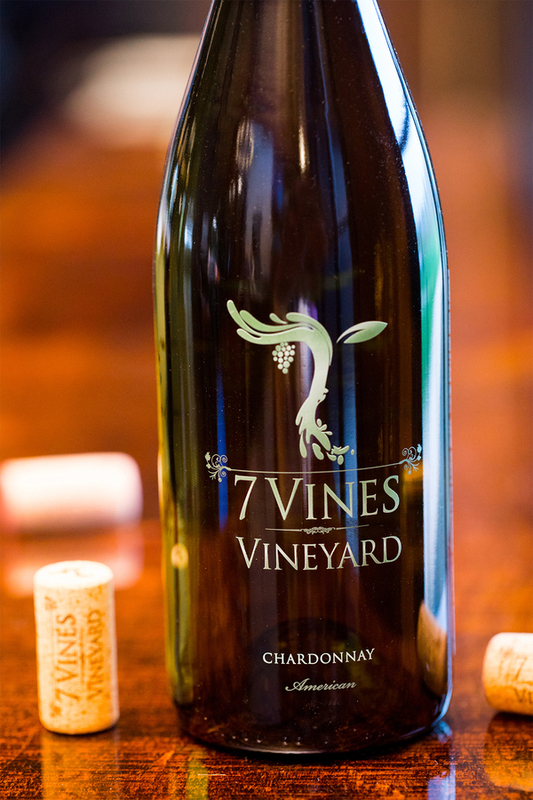 Grapes from the Russian River Valley in Sonoma, California have yielded us this lovely Chardonnay. Yellow apple, lemon zest and light floral aromas open effortlessly into the glass and awaken your senses with a soft, creamy note on the nose. This Chardonnay’s aromatics are complemented by flavors of white peach, citrus, and a hint of butterscotch. This medium bodied wine is balanced, crisp and refreshing leaving you salivating for more. Pairs well with oysters, light fish, salads, chicken, and pasta. This elegant wine is finely structured in your glass, opening with a violet perfume and deeply scented black cherries that fuse together with sweet and toasted confectionery delights. 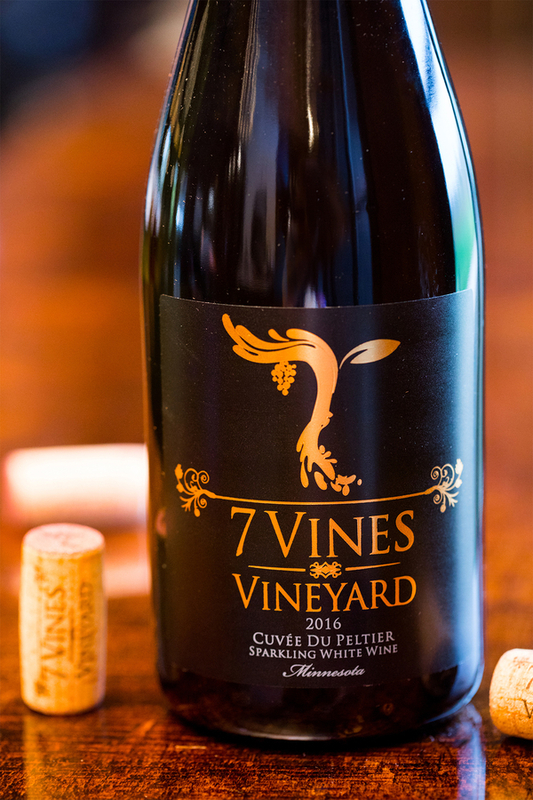 This zesty red wine has hints of pepper, clove and anise that enliven the palate along with blackberry and candied cherry. Finishing with toast and earthiness, this Marquette will leave you feeling warm and cozy. Reward yourself and pair with a roaring fireplace, good friends, rich cheese and artisan charcuterie. Chocolate covered black cherry, brambly black fruit and plum make this peppered red wine one of our favorites. Brambly blackberry, brandied amarena cherry, dark chocolate and Christmas cake begin your sensory journey with our Marquette. Marquette, introduced by the U of MN in 2006, has certainly been of the state’s favorites – and for good reason. Ours, layered with notes of black pepper, plum, thinly sliced carpaccio and juicy cherry – all snuggled in with notes of vanilla and clove make this one of our favorites any time of year! 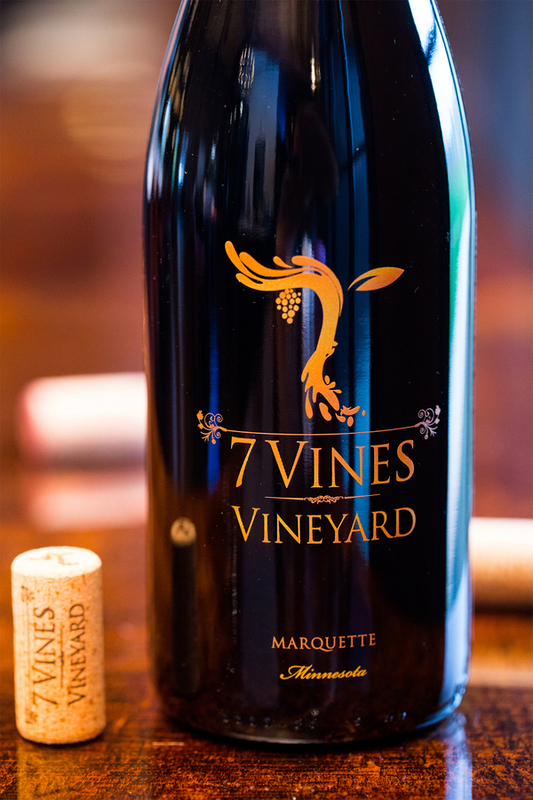 This first vintage of Seven Vines Marquette is a beautiful, pure expression of Marquette. The color is dense purple and the wine offers up notes of spring flowers, a touch of background licorice and spices with wood and blueberry fruit. The taste is refreshing and bright. It opens with ripe berry and sneaks to a subtle holiday spice finish. The tannins are light, dry, and provide great structure. Perfect with grilled burgers or a thick juicy rib eye. A Minnesota sparkling wine that is sure to surprise you with its savory components. Bright with persistent perlage, this sparkling is certainly one that will have you wanting for only one thing…more! Gorgeous fall-ripened yellow apple, cantaloupe and quince charm the senses as the palate makes a full transition into a surprisingly savory character. Herbal, with notes of sage and thyme make this a perfect combination to a cheese plate or savory board of charcuterie. Cuvée is French for blend and this estate Vineyard sparkling wine combines our Frontenac Gris and Frontenac Blanc grapes. Small production makes this highly sought after wine a hot commodity. The palate is exquisite with light bubbles. Full of flavor with good acidity and impressions of nectarine, pineapple and buttered toast. Fruity and crisp with a beautiful clean finish. Big and bold dark fruits including plum, blackberry, and blueberry are rounded out with aromas and flavors of chocolate, pepper, spice, and a touch of coffee. 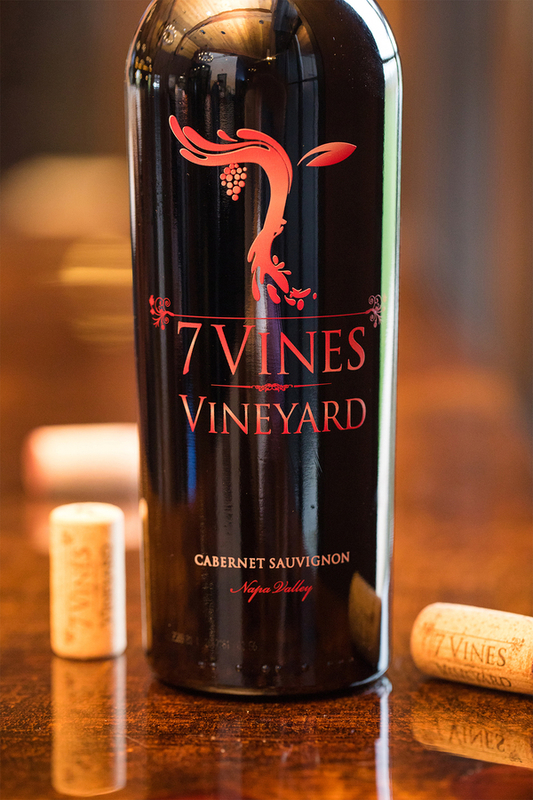 This flavorful blend yields Zinfandel grapes from Dry Creek Valley, Merlot grapes from Lodi and Frontenac from 7 Vines. 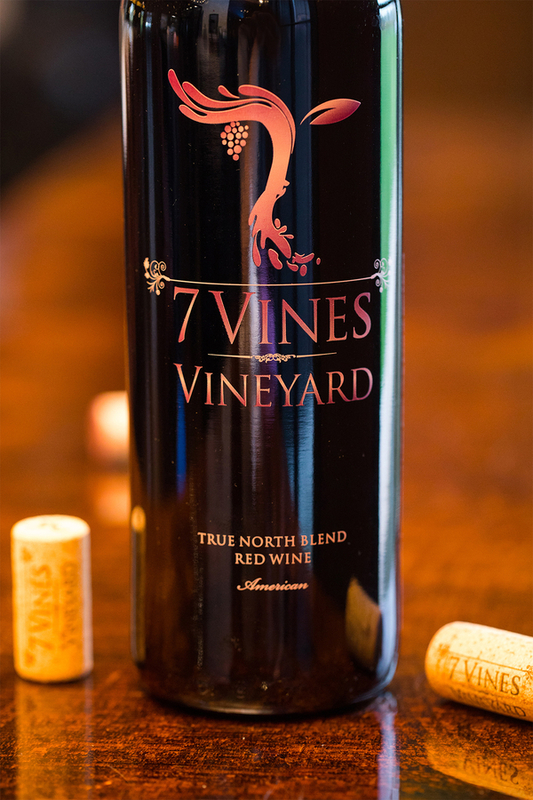 True North is a full bodied red wine that engages the senses and is perfect to pair with steaks, BBQ ribs, a meat filled pizza, and good conversation. This deep ruby rich delight is packed with mouth-watering splendor! Robust cherry, blackberry, cranberry, raspberry and bramble, flourish the senses. With a vanilla, smoky finish and a dusting of cocoa and baking spices, this wine will make you want to slow down and enjoy time with friends and family. Pair with a favorite movie, creamy potatoes, or hearty dishes for the soul. Grown in Yountville, California right in the heart of the gorgeous Napa Valley, and brought to us by our consulting California winemaker, Ryan Waugh, this stunning fruit is a real treat to bring to Minnesota. A beautiful barrel-fermented sauvignon blanc, really complex but tightly integrated. Shows attractive lemon, lime and grapefruit citrus fruit aromas as well as ripe peach and green mango across some gentle minerality. The oak is subdued and discreet, adding a neat spicy and gently savory thread. There's a wealth of flesh and weight and concentrated melon with a wash of lime juice; great acidity, smooth and supple texture, finishes succulent and flavorsome, gently creamy. Just delicious! This fresh, yet seductively alluring Riesling will have you ‘all in’ with its tantalizing florals and clean citrus + pear notes. 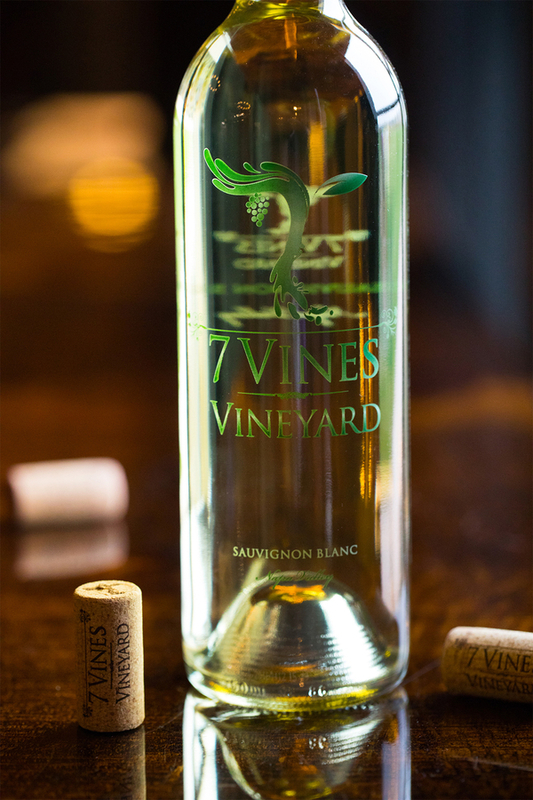 White peach, fresh spring white florals, mandarin and thinly sliced pear tantalize the senses before the wine even hits your palate. 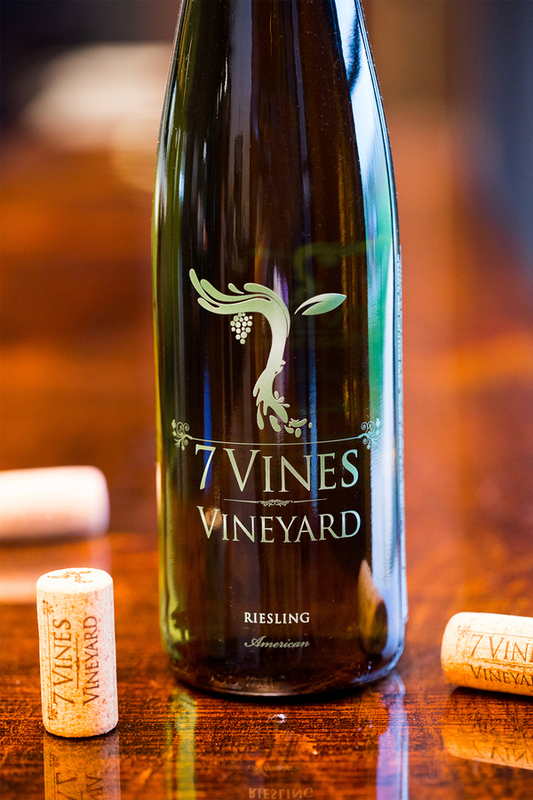 Mouthwatering and inviting, this delicious Riesling comes away with clean D’Anjou pear, candied lemon zest and pops of zesty citrus. A wine delightfully perfect for those looking to expand their repertoire of dry Rieslings. Aromatically sensational with notes of white peach, honeycomb and tropical fruit! This wine is so aromatically…well, La Crescent. One of Minnesota’s newest grapes (released by the U of MN in 2002), La Crescent is rarely ever shy in the aromatics department. 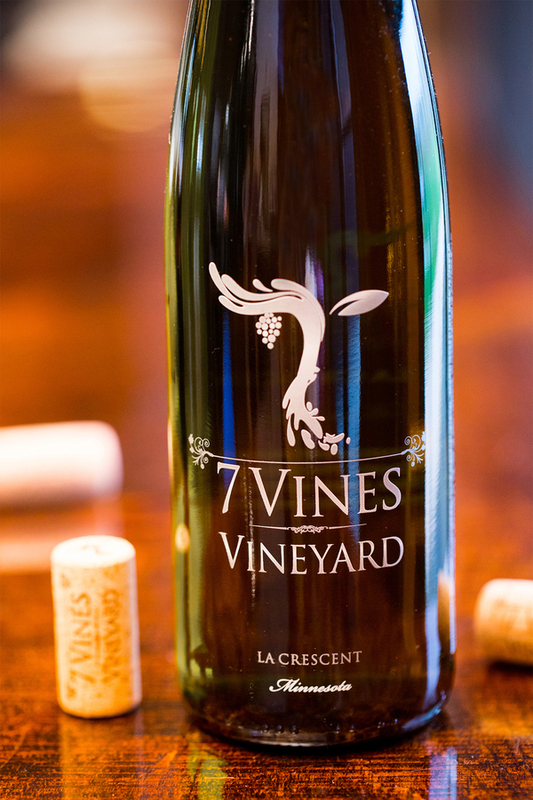 Our La Crescent proudly displays notes of raw honeycomb, fresh tropical fruit and white peach. Across the palate – green apple, crunchy cold cut pear, kiwi, brûléed lemon rind and starfruit make way for one pleasantly textured mouthfeel. Dry + delicious, perfect for any number of different food pairings and settings. 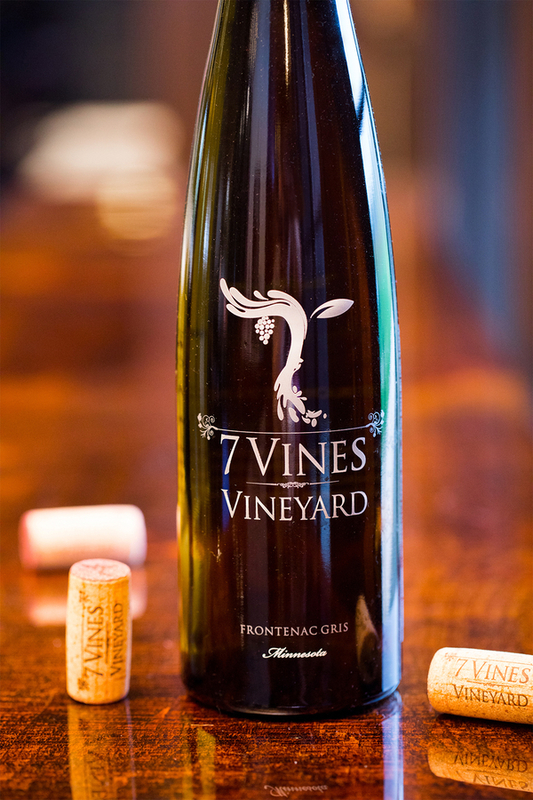 This is the first vintage of Seven Vines Frontenac. True to the varietal, you will find a distinctive cherry aroma and an inviting palate of blackberry, black currant, and plum. The color is a beautiful garnet red and plum flavors dominate the palate. Great acidity and low tannin allows for this wine to be enjoyed by itself or delicious with your favorite lamb, duck or meat dishes. Does your palate need a vacation? This is the wine for you! Sipping this will have you thinking of the tropics in no time. Descript: Brûléed mango, tropically ripened kiwi and juicy pineapple are just a few of the first things your palate starts to connect to when your nose first hits this wine. Intertwined with notes of panna cotta, textured caramel and sun-dried papaya, our Frontenac Gris is certainly one that will have your palate on a tropical vacation before you’ve finished your first sip. Enjoy! 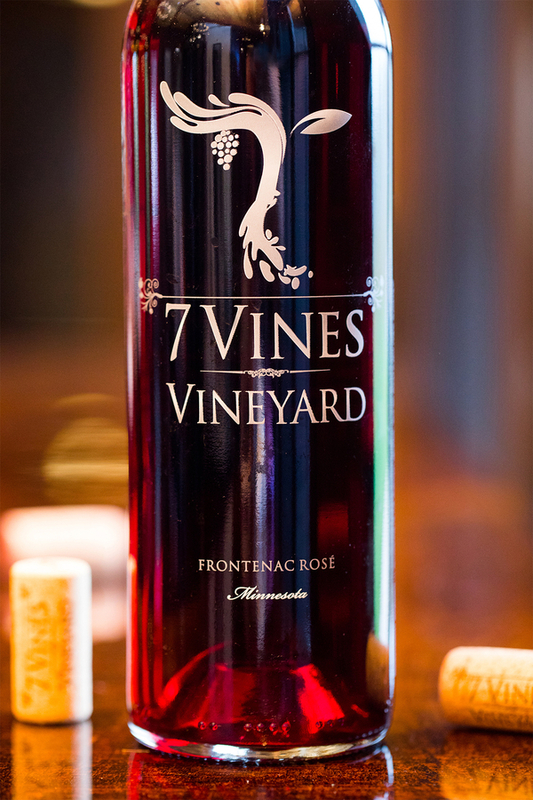 Juicy summer red berries, candied cranberry and rosemary make the aromatics of this dry rosé hard to resist. Juicy summer raspberry, bright fruit punch, cranberry, fresh violet and rosemary make this wine’s aromatics hard to resist. Dry, with notes of cranberry, bursting red cherry, prickly pear, fresh cut garden herb and pomegranate make this an impeccable accoutrement to savory proteins like pork, chicken, beef or even a salty cheese board. Absolutely gulp-able! Grown in Oakville, California amongst the greatest Cabernet vineyards in America, our Consulting California Winemaker, Ryan Waugh, has brought us something special from the world-renowned Napa Valley. Firm and well-structured, with a pleasing burst of blackberry and wild berry, plum and black cherry notes, tilting into a fruit-bowl medley of currant and raspberry flavors. Full-bodied and layered with nothing out of balance, look for this wine to drink well young, yet age effortlessly for 20 years.